One of Germany's biggest talents on the saxophone. Get Two Unreleased Songs For Free! Born in a small village in rural Bavaria, Tobias Meinhart has spent the last 15 years carving out a career for himself in the international jazz scene. Since his modest beginnings in Woerth, the tenor saxophonist has garnered acclaim in both Europe and the United States, earning a nomination for an ECHO award in 2016 and claiming residency at renowned New York City jazz venues such as The Blue Note, The Jazz Gallery, Jazz at Lincoln Center and Birdland. Tobias began his musical life as a drummer before switching to the saxophone at age thirteen. He found inspiration in his grandfather, a classically trained bassist who began playing jazz in many of the U.S. Army clubs after World War Two. This early and intimate exposure to the music had a profound effect on young Tobias, leading him to hone his skills to a tee and win first prize in Germany’s Jugend Jazzt competition. After touring throughout Germany with his quartet Fourscore, Tobias went to study at the Basel Music Academy in Switzerland, where the renowned European saxophonist Domenic Landolf served as his mentor. His teachers included Adrian Mears, Jorge Rossy and Wolfgang Muthspiel. He then went on to the Conservatorium van Amsterdam and the Bern University for the Arts to study with Ferdinand Povel and Andy Scherrer. While still a student, Tobias caught the attention of critics and audiences throughout Europe. His band won first prize at the 2009 Startbahn Jazz Competition, as well as the “Audience Award for Best Group” at the 2009 Getxo Jazz Festival in Bilbao, Spain. Already endowed with more real world experience than many musicians have long after leaving school, Tobias graduated with honors and received a diploma in Jazz Performance and Music Education the same year that he won the prize at Getxo. Shortly after Graduation, Tobias moved to New York City and quickly became immersed in the city’s highly competitive music scene. In 2012 he received his Master’s Degree from the Aaron Copland School of Music, where he studied with Antonio Hart, John Ellis and Seamus Blake. 2012 was also the year that Tobias returned to Getxo, now with his quintet, and earned not only first prize for the band’s outstanding performance, but also the “Best Soloist” award, and the opportunity to open for of his most forceful inspirations, Wayne Shorter. He has five albums out under his own name, with his newest effort, Berlin People, released in Spring 2019 on Sunnyside Records. It is a new band including guitar icon Kurt Rosenwinkel. Aside from the numerous accolades already mentioned, Tobias has also toured Russia, Brazil, Mexico, Spain, Italy and Poland and opened for renowned saxophonist Chris Potter. He has been featured at many European jazz festivals including GetxoJazz and Elbjazz, and was part of a national Next Generation All-Star Orchestra. His 2015 album Natural Perception was praised by European and American critics alike, hailed by the Frankfurter Allgemeine Zeitung as “jazz at it’s finest” and as “graceful and organic… subtle colors and delicate rhythms” in a five-star review in the New York City Jazz Record. 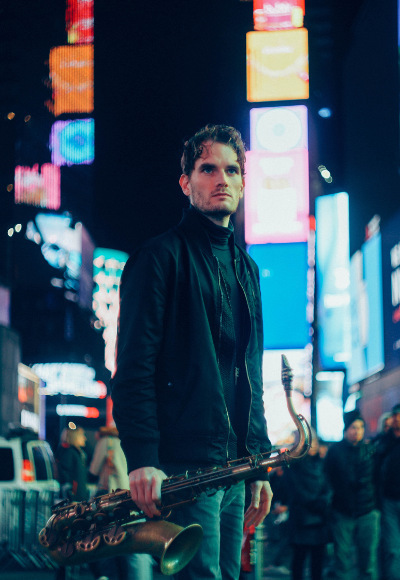 In 2017, Tobias released Silent Dreamer which got a DOWNBEAT feature article describing him as “Not only a commanding saxophonist but also a keen composer”.